A CD recorded in 2014 at the Taizé Community. The disk Taizé – Music of Unity and Peace is the result of an unprecedented collaboration between the Community and the international staff of Deutsche Grammophon / Universal Music. The latter offered their experience and expertise to produce this album. The Community welcomed this project with a view to making its songs known to a wider audience. Those who have already taken part in the international meetings in Taizé will meet once again the atmosphere that touched them. Many others will discover a reflection of that contemplative prayer. After the bells, familiar with visitors to Taizé, we are led into songs interpreted by a choir of young adults and musicians from different countries, some recordings made during the community prayers in July 2014, and also some psalms and responses sung just by the brothers. 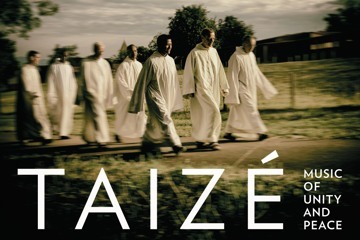 You will therefore hear on some tracks the choral singing of more than two and a half thousand people, whereas other pieces give a taste of the intimacy which envelops prayer in Taizé. The song “Let all who are thirsty come” is included for the first time in a recording. 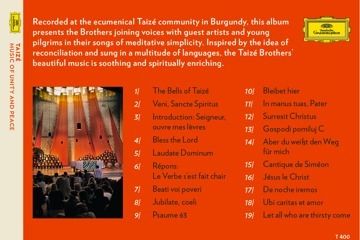 >>> The CD is available in the shop in Taizé and in record stores in many countries. You can also buy it on-line.